The Totally Green Crafts Contest has begun! Check out the Announcement Page for the rules and submission guidelines. This season, our theme is Sweaters and T-shirts! Create something amazing with recycled sweaters or t-shirts. Submit it, and you could win one of the amazing prize packages below! And what can you win? Well, sit back, grab a cup of coffee, and check out this amazing list of sponsors! Hi, my name is Alison Wood and I’m passionate about crafts and creating online spaces where I can bring together makers and lovers of all things handmade. You can find me at Arts of Crafts where we talk about all types of crafts and also at our sister site, Art of Crafts Directory, where you can discover a world of crafts and supplies and also create a listing for your handmade business. Alison is offering a $30.00 Amazon Gift Card. Monica is a wife, mother, homeschool mom and music teacher. She enjoys blogging about her homemaking adventures at Homemaking with Monica. Topics covered on her blog include craft tutorials, recipes, decorating, entertaining, party games and much more. Monica is offering this beautiful handmade glass pendant necklace and a $25.00 gift certificate to Etsy. I’m Carolyn – a consulting marketing manager and blogger at Homework. The name “homework” originated with my marketing consulting business. Since I was working from home, I named my company “homework”. When I started blogging, I kept the name since it still fit. The only change was adding my tagline: today’s assignment – be inspired. I love to create things. I am super happy when I’m working on a new project and I’m constantly on the search for new inspiration. I enjoy all types creativity – paper, sewing, gardening, cooking, decorating and more. Mariely is a 24-year-old beader, crafter and new blogger from Puerto Rico, her website is Sensational Creations. She loves making bracelets, crafts and scrapbooking. She started making jewelry for herself in 2009 and then, on January 2012, she decided to start selling her creations. Mariely is offering; two elastic bracelets, one wired bracelet and a pair of earrings for a value of $25. Suzy’s Artsy Craftsy Sitcom is offering The Partridge & Pear Pattern book, from my premium pattern collection. Color suggestions and links to tutorials for both faux stained glass and aluminum embossing are included. And from my kit section, the Majestic Peacock Faux Stained Glass Kit. The kit contains all supplies that you need to create your own faux stained glass, including a full sized pattern, illustrated instructions, and all paints and glue. All you have to supply is the frame and glass! Both the pattern and kit are a $27.00 value. Brown Sugar Toast is the creative outlet of Christa Threlfall. Christa’s passion is encouraging women to live creative lives in Christ. You can usually find her running, playing with her two kiddos, consuming unhealthy amounts of cookie dough, or blogging at BrownSugarToast. Christa is offering her Pinkberry Adult Headband and Pinkberry Baby Headband from her shop, Brown Sugar Toast, valued at $25.00. Hello, I am DeDe Bailey, I blog over at Designed Decor. On my blog, I write about handmade, decorating and just plain living. My passions are creating home accessories and decorating my home. I specialize in stained glass and mosaics, but I enjoy hand making just about anything. This eye-catching stained glass snowflake sun catcher is made with clear triangle beveled glass and light blue glass gem stones. Each piece of glass and gem stone are wrapped in copper foil and then soldered. The beveled glass adds dimension to the sun catcher and allows for the light to reflect off the bevels. The sun catcher measures 6 ½ inches and is valued at $25.00. Cheryl from Sew Can Do is offering your choice of five free patterns from her Etsy shop, The Green Hedgehog. Cheryl is a self-taught crafter and designer who loves to share crafty ideas, creative tutorials and giveaways. 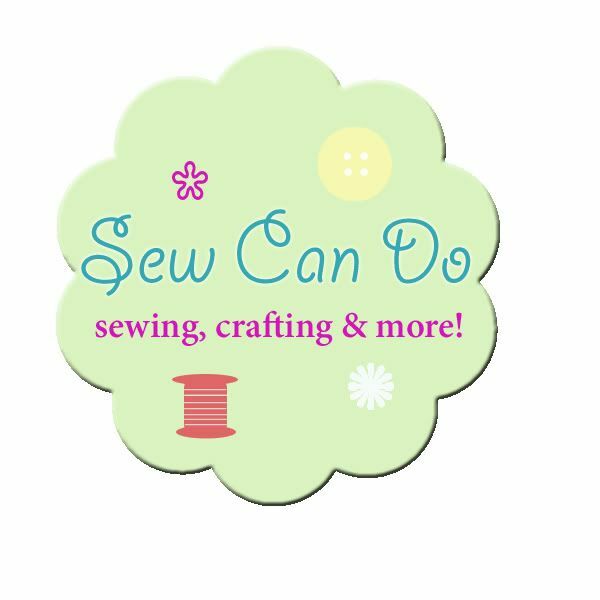 Sew Can Do is the place to find thrifty and unique projects for sewing, kids, treat making, decorating, gardening & more. Come share some crafty adventures! Want to see some of the previous winners?